I am a sixteen-year-old high-school student at Farias Brito Educational Organization in Fortaleza, Brazil. I really enjoy math and physics, but I love computer science. Since 2009 I have been participating in scientific olympiads in the fields of mathematics, physics, informatics, biology, and chemistry. I have been to countries like India, Mozambique, and Argentina, representing Brazil in these olympiads. I am a busy person and I like the way I live, but I spend my free time watching movies, hanging out with friends, or learning something new, like taking piano or acting classes. I am capable of doing anything to avoid boredom, and that is why I keep such a busy schedule. 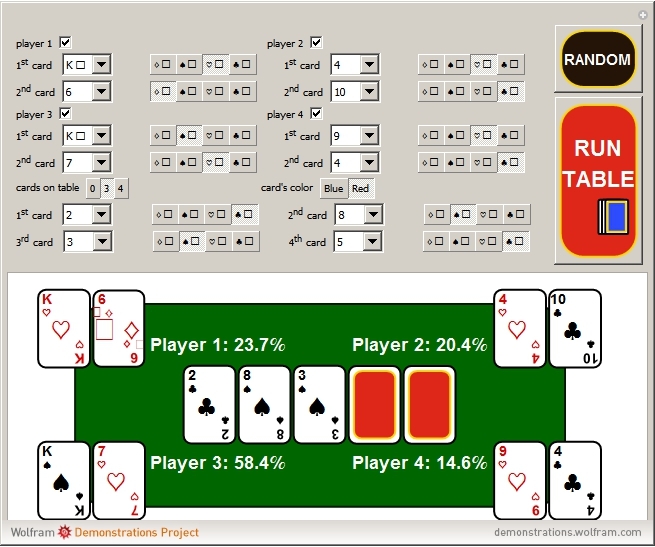 The Demonstration receives as input a poker table at a given moment (which can also be randomized), and it returns each player's chances of having the best hand after the river (last card). It works by testing all possibilities for the remaining cards or by running a Monte Carlo simulation to get approximate results.